Meet Justin "Coro" Kaufman, Founder and Art Director of Massive Black*. As one of the most sought-after artists in the gaming industry, Coro relies on the Intel® Core™ i9-7980XE Extreme Edition processor to bring his high-quality artwork to life. Watch Coro's story to see how Intel® Core™ X-series processors transformed his creative process. Optimize your machine for video production with an Intel® Core™ i9-7980XE Extreme Edition processor to create a great looking render in shorter time. 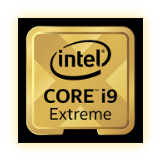 The Intel® Core™ i9-7980XE Extreme Edition processor gives content creators the power to work more effectively, enabling extreme mega-tasking and providing a platform for rendering high-resolution 4K and VR. Capitalize on the 44 PCI express lanes in the Intel® Core™ X-series processor family to take full advantage of your hardware, such as video cards and USB 2 devices. Choose a processor that fits your needs with total cores ranging from 6 to 18, further enhancing your creative productivity. More lanes and more cores mean more data can travel faster. The Intel® Core™ X-series processor family comes ready to support Intel® Optane™ memory and Intel® Optane™ SSDs for faster app response times and system acceleration. This unique technology provides system responsiveness for large capacity storage drives, making everything you do smooth and easy with an unparalleled combination of high throughput, low latency, and high endurance. *Other names and brands may be claimed as the property of others. We're sorry. This promotion has ended, but we have many more deals and bargains at Newegg.ca! Earn big savings every day with Daily Deals and steal hot products at rock bottom prices with Shell Shockers! Never miss your chance for big savings again by signing up for the Newegg Newsletter!